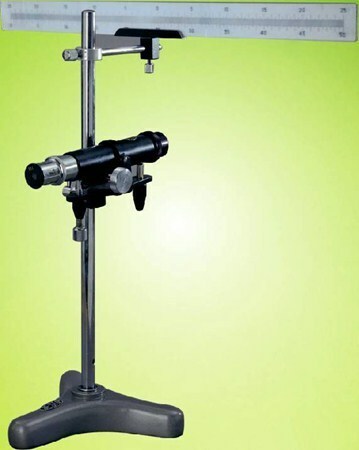 improved design, college pattern) tube is fitted with vertFor use with Mirror Galvanometer or an Optical lever or for general laboratory utility. We have been offering internationally acclaimed Research Lab Equipment to a number of customers in India and abroad. We offer Physics Lab Equipment, Chemistry Lab Equipment, Laboratory Consumables, Oil & PetroleumLab Equipment and much more. Our range of lab equipment are based on precision technology. We manufacture superior quality laboratory equipment that are made of durable materials. Our infrastructure is equipped with state-of the-art facilities with in-house manufacturing, designing, printing and model making units. We have modern technology machines for manufacturing high quality products. Our team comprises of professionals who have in-depth knowledge about this field. They work towards improvisation and upgradation of the system. All our staff members are proficient in the field of science which enables us to come up with equipment that help in taking accurate readings. We lay an emphasis on the training of our personnel. Because of this reason, we conduct workshops and regular training sessions for all our employees and staff. We are a customer centric organization, therefore we aim at maximizing customer satisfaction. On-time deliveries add to the delight of the customer thereby making us one of the preferred brands. 3724, Opposite Kali Bari Mandir, Ambala Cant.